Winner, Winner Turkey Dinner: Secretary @ArneDuncan Wins Award! The blog Cloaking Inequity seeks to illuminate popular and dominant ideologies that purport to foment equality and close the achievement gap. Often well-intentioned citizens support educational policy that claim to create a more inclusive and better quality education system— unbeknownst (or beknownst) to them— these policies magnify and hide inequality by utilizing an elegant, yet false, bureaucracy of data, research and media promotion. This year, the 2014 Educational Policy Turkey of the Year Award was voted on by nearly 1,000 readers of Cloaking Inequity. The award is based on Cloaking Inequity posts from calendar year 2014. 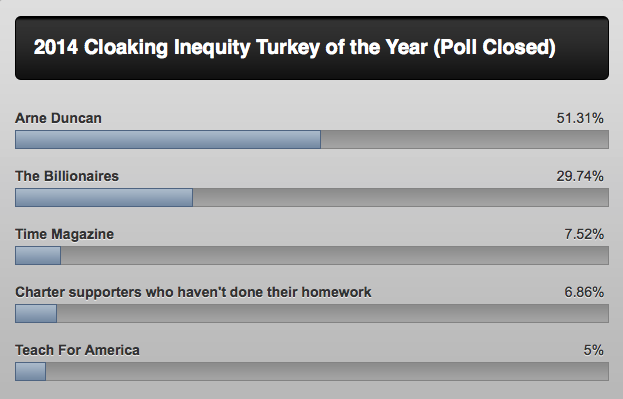 With 51% of the vote, the 2014 CloakingInequity.com Educational Policy Turkey of the Year award goes to Secretary Arne Duncan. For all posts that mention Arne Duncan click here. Bird is the word. Congratulations Secretary! 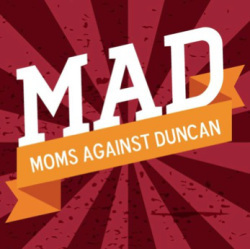 Also check out the Moms Against Arne Duncan (MAD) Facebook group here. Please blame the Arne Duncan for any typos. In (dis)honor of all of the havoc wreaked by Peer Assistance and Review I hereby change Arne’s name to PARne Duncan for his support of the wholesale destruction of teaching as a profession. Well, right now he’s the top bureaucrat in education, … and, bureaucrats use “street level” behavior; i.e., pick and choose what’s important, what’s not, … His leadership supports “competition” between schools, school districts, supports charters, and supports monetizing the value of children. He supports turning children into commodities. In such a system some children are more valued than others- duh! Thus, inequity grows. He supports diminishing the role of those who are really at the center of the education endeavor (teachers) and they rely on a leader who supports equity in order to do their job with integrity. He wants teachers competing with each other using a false assumption that standardized texts work to evaluate teachers fairly. He really deserves the “Turkey of the Year” award!